Liebert EXM UPS, 10-200 kVA/kW - Revco, Inc. 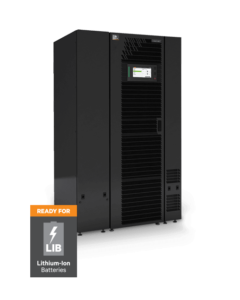 The Liebert EXM UPS is based on a reliable, double conversion power topology that uses an efficient transformer-free design. Excellent efficiencies of 97% are generated and can be enhanced to 99% using our unique Eco Mode. A unity power factor delivers more capacity in a smaller footprint. Available in a fixed capacity or a scalable, redundant configuration from 10-200kVA/kW in 208V and 50-250 kVA/kW in 480V, each utilizes a modular construction design with optimized ancillary cabinets designed to save the customer footprint and cost. The new touchscreen control panel ensures Status At A Glance convenience, flexible views and multiple security options. Intelligent controls and communications integrate with Liebert Nform, SiteScan and the Trellis Platform as well as 3rd party BMS and DCIM systems. LIFE Services provides 24x7 remote monitoring by our expert staff to improve availability and lower labor costs.